Recent scans from VJump show off variations of what we got in the last trailer from Jump Festa. 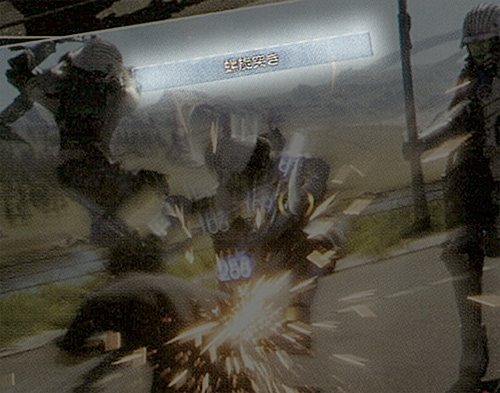 One thing that wasn't in the Jump Festa trailer was the little window shown on the screenshot above Noctis holding the lance while charging forward. I saw people talking about it on Twitter and wondered what it said, and I found that it says 螺旋突き. 螺旋 meaning "spiral" and 突き meaning "thrust". The various text around these images describe the idea of closing the distance with this attack and seems to be this weapon's special attack. What does this remind you of...? See how it reads "Lightning" at the top in a window. Looks a lot like this window we see in the screenshots in this scan, doesn't it? The "Spiral Thrust" window shares the same UI style as the current UI in game, which means it's not just added on for the sake of the magazine, but actually looks like a feature yet to be demonstrated in video! 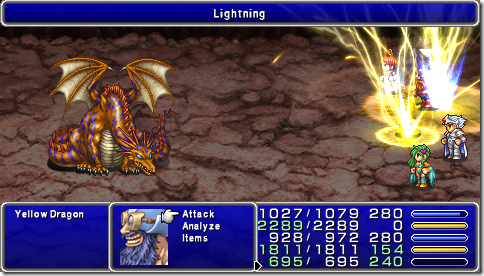 I think it's a nice added feature to the battle system to really make it feel more like a Final Fantasy game, it will be fun to see your special attacks show up on screen like this. I'm sure they will do the same for your tandem attacks and other special actions as well. I just figured I'd post about this, as I thought it was really interesting! I would have posted it in an existing thread, but there wasn't an active one that really would fit, and I didn't want to revive an old thread... So, please excuse me for creating an entire thread just for this. Please let me know what you think about this if you have an opinion. I don't know if there's already a general news thread for Final Fantasy XV but I think it's more comfortable to have one place where all the information come together then 234 threads for every new info bit. Especially for a smaller community as it's here. So I'd appreciate if you could post all future updates for the game here. Update: damn don't know how to do that !!! Maybe the mods could merge existing News/Article threads into this one? Should be easier to keep track that way. I wouldn't mind for my recent thread to be merged here as well. Why? It's better to have separate threads for each news. It makes sense for a large active community like gaf or gamefaqs to have constantly new threads but not here. I don't see anything positive on splitting conversations between 5 people on 4 different threads. Another advantage for one general thread is that we can now easily look up older news without searching for hours. Why do you think it is better to have seperate threads? I think it might be worth having a small subforum dedicated to FFXV news. With regular Active Time Reports coming in, the number of threads will only increase, and having them all neatly organised into one place seems preferable to having them bunched up with other general FF topics. Alternatively, a general FFXV news thread can work (if a moderator can sticky it) as long as someone is willing to update the opening post with each new disclosure of information. We're not a forum the size of NeoGAF with hundreds of replies per topic, so this should be very manageable. We've had one before, and as you can see, it didn't work. Well Squirrelmemperor have a single thread dedicated solely to Xenoblade Chronicle X, for every tiny piece of information, it could work. This is a great idea, and if everyone can at least try to maintain a single thread dedicated to ffxv . It gets irritating having to search throughout the entire Final Fantasy thread for only ffxv related info. 1) Use the search toolbar. Cause that’s how you find old threads and posts. 2) Make good descriptive thread titles. So people know what the thread is about and consists of. 3) Look to see if another thread exists already before making a new one. Helps to be able to do all three cause they kinda work together. It’s not a forced rule though. Nobody has to abide by this until site staff makes it one. The XCX thread is really not active. It only gets active when there is major news such as last week, but the number of posts that come from it is pretty tiny. Is it worth making a ton of separate threads that nobody will post in? Cause that’s probably what will happen. This can be said with a lot of games too. Not really the case with FFXV, which is the hot topic on this forum. I've merged some other posts (or copied!) into this thread... and I'm going to sticky it. That alright with everyone? Thank you for this. It's appreciated. I really love this, thank you. The only new thing i see (?) is Noctis parring with a new spear design. We already saw this in the jump festa trailer.